I finally reached the point after baby that my hair has started falling out (between 3 and 4 months for me). I was so hopeful because with my second baby it was just find ... it must be the boys that make my hair fall out! It's really bad this time too. It's the 1/2 inch all around my hair line which is quite noticeable. It's terrible! Not only am I pulling out clumps of hair at a time, but my hair also feel like straw which is a first. I have tried different shampoos and conditioners, I have tried a different brushes and combs. Nothing seems to work. I have made numerous homemade shampoos and conditioners in the past, but none of them seem to work great for my hair type. I will be the first to admit that the thought of putting egg and mayonnaise in my hair was a little off putting regardless of what people say. But, desperate times call for desperate measures so I was going to try a homemade deep conditioning treatment. If you were to see my hair, you would realize why I have the change of heart. I needed to try something new ... anything! 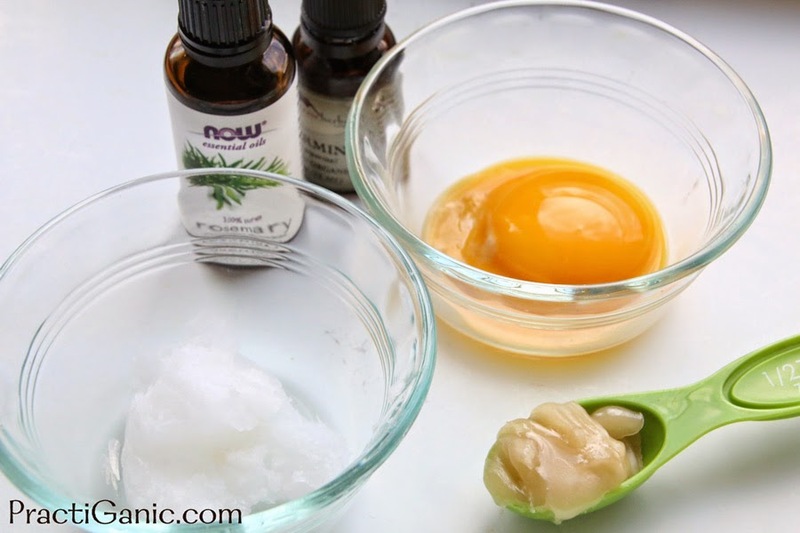 There were lots of recipes out there so I put a few together to make the best for my hair. 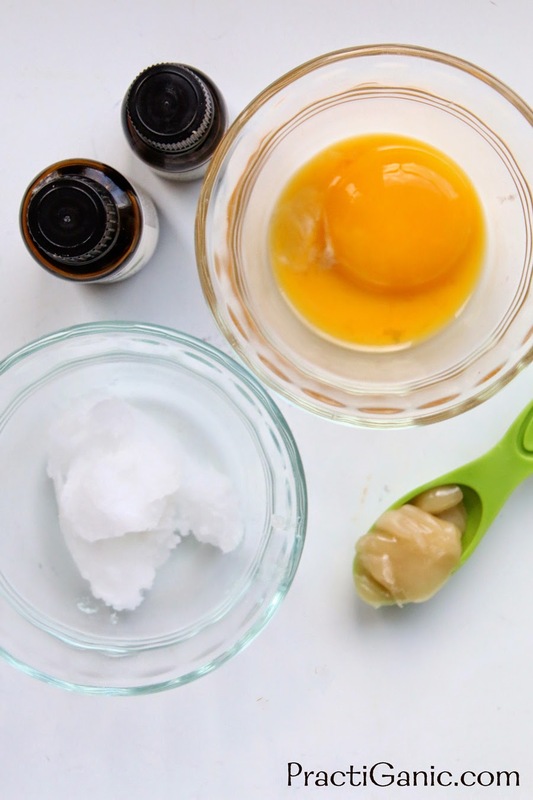 I wanted egg yolk because the proteins rebuild damaged hair as well as help strengthen it. I wanted coconut oil because my hair has been so dry that I needed to use a strong moisturizer. I have had many people tell me that they regularly use coconut oil on their hair and love it. Coconut oil will be a bit lighter and give more shine than olive oil. Lastly honey, I wanted honey because it is filled with nutrients that encourage hair growth as well as help your hair retain its moisture for the inside out. There were a few that recipes that would add in a teaspoon of apple cider vinegar for shine but that wasn't my priority and I figured I would get good shine from the coconut oil (which I did). There are many essential oils that you can use for your hair. I tend to stay away from lemon and lemongrass in my hair because they can really change your color, some people love that though. Here are a few of my favorites. Lavender: Good for all hair types. Calms the scalp. Peppermint: For dry hair. Stimulates scalp increasing hair growth. Rosemary: For oily hair. Promotes hair growth as well as a dandruff treatment. Tea Tree: For oily hair. Helps dry scalp, dandruff and even lice. Good for 1 mask for medium length hair. Melt coconut oil so it is a liquid. Add remaining ingredients and whisk together. Take sections of your dry hair and begin running the mask through your hair as well as massaging your scalp. Once your hair is completely covered, tie it up in a bun to keep it together. Rinse with warm water and then wash thoroughly. I have been doing this treatment once a week, helping my hair get stronger and I'm seeing less breakage and my straw-hair is long gone!